The January 2015 Cancer horoscope predictions foretell that you should spend more time in increasing your social circle and seek their assistance to execute your plans. You should avoid confrontation with others and keep their interests in mind in all your actions. 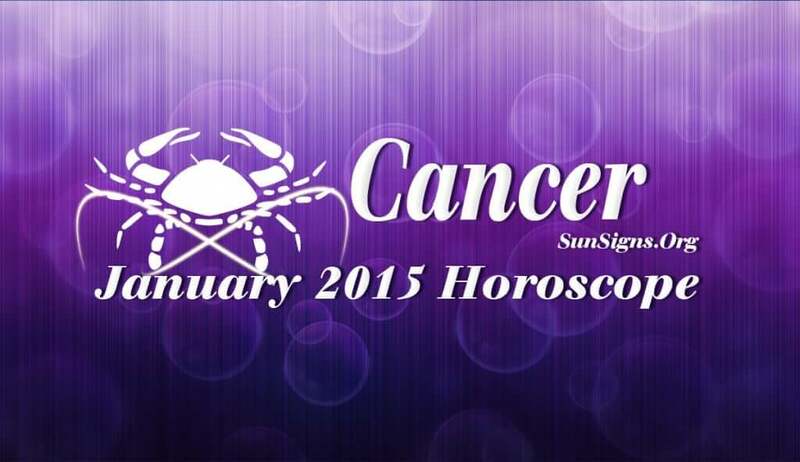 Domestic concerns and professional affairs will be in focus alternately for the Cancer zodiac sign in January 2015. You will have to face emotional disturbances due to the planetary relationships in your birth chart. The Cancer monthly forecasts for January 2015 predict that the month is ideal for launching new businesses and also completing the existing projects at work after clearing all obstacles. The Cancer January 2015 financial horoscope foretells a successful period with minor obstructions. Finances for the Crab will look up with the grace of other people and family members. Try to reduce your loans by using the surplus money. Your financial acumen will help you be in sound financial health. The Cancer love horoscope for January 2015 asks you to be careful when entering into new romantic partnerships during the month. Postpone your decisions for marriage or ending relationships to another month. This is a good month to plan for a child. Pregnant Cancer women will be blessed with good health. Family affairs will get due attention because of your basic nature. Your interests include spirituality and religious matters. The Cancer horoscope January 2015 foretells that your health will be excellent during the month. Take sufficient breaks to rejuvenate yourself from time to time.